I love birds, I really truly love bird watching. But it is an infinitely frustrating exercise as well, particularly if you are in a hurry. And it seems on almost all my trips I am in a hurry. 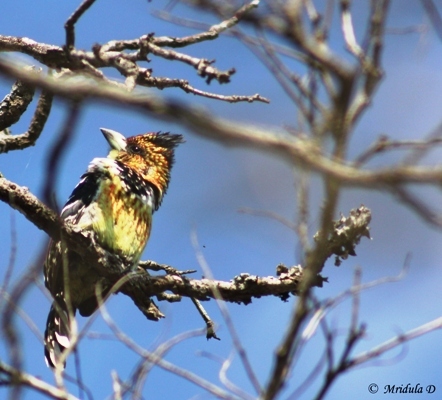 So look at this at this Crested Barbet. I mean birds have a knack to go and sit such that you can hardly click a clear picture. I was craning my neck at various angles to get this bird minus branches and this is the best I could do!